Sawing services for parking lot repair, road construction, or circular holes. Common asphalt cutting services include small projects such as installing light posts in a parking lot or larger projects such as longitudinal cutting for a hundred miles of highway; Ohio Concrete has the manpower and equipment to accomplish projects of any size. 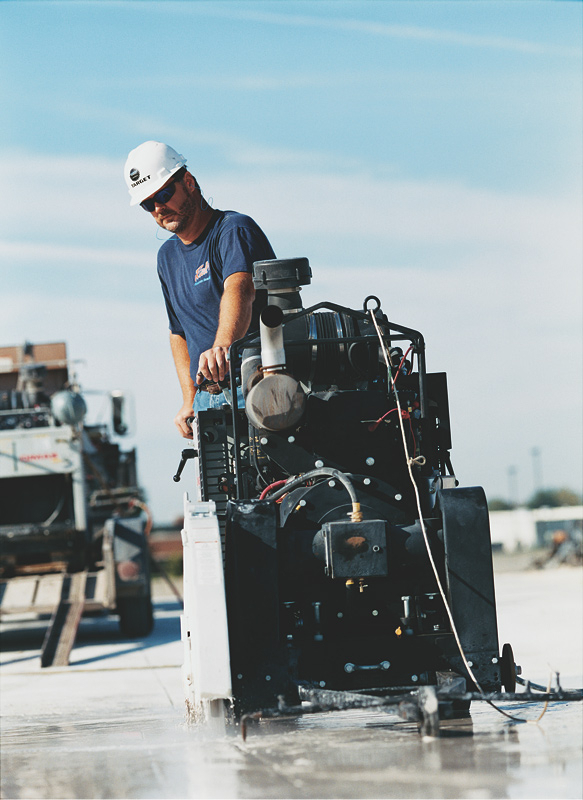 Other common forms of asphalt cutting include sawing the perimeter of areas that need asphalt repair. This provides a clean edge to improve the appearance and effectiveness of the surface repair. Sometimes this includes sawing through multiple layers, including brick and/or concrete of older installations. Other services include circular openings for parking lot lighting or drainage projects in asphalt of up to 60" in diameter. Removal of the asphalt and cutting debris can be taken care of by the experienced team at Ohio Concrete. As an asphalt cutting contractor, we have several different saw sizes to make your project easy to execute. Our fleet of saws is process of converting to Tier 4 diesel compliant. Call today and get our competitive asphalt cutting prices.